Located on the North side of Lake Boca Raton, Por La Mar homes for sale are some of the most sought after single family homes in Boca Raton. While this isn’t a gated community, it is one of the oldest and more exclusive neighborhoods in all of Boca Raton. Translated from Spanish, Por La Mar means ‘by the sea’ because it is within walking distance to the beach. Homes for sale here enjoy all the benefits of deep water dockage in a no-wake zone and no fixed bridges. There are both waterfront and dry lot luxury custom built homes in this community; each home enjoys special views of sparkling waterways and lush greenery. Residents of Por La Mar homes enjoy being close great amenities such as Mizner Park, Royal Palm Plaza and Town Center Mall. Interested in learning more about homes for sale in Por La Mar? Read more about this neighborhood or browse through some of our listings below. 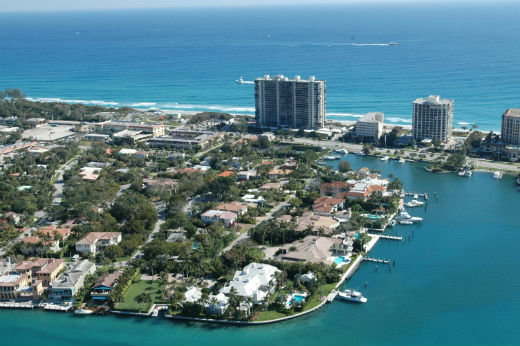 Situated East Boca Raton, between the A1A and the Intracoastal, Por La Mar is a community with less than 100 homes. Homes here range from 1,500 to 15,000 square feet in size. Because this is an established tropical community, the streets are characterized by mature trees and lush greenery. Por La Mar real estate is conveniently located only moments from Boca Lake and the Boca Raton Inlet. Homes here come with an array of luxury amenities such as lakeside / intracoastal swimming pools, beautifully landscaped yards, and impressive Mediterranean exteriors. You will also find an assortment of condos to choose from. Por la Mar homes and condos can be found in a wide range of sizes, styles and prices; there's a little something for everyone here! Por La Mar real estate is wonderful and we are experts that can help you find the perfect home in the area. Contact us or call 561-406-8880 today to learn more about exclusive real estate opportunities.